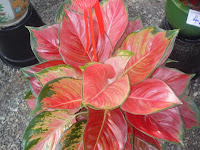 Aglaonema sp is a genus of about 40 species of foliage plants in the family Araceae, native to the tropical swamps and rainforests of southeastern Asia, fromBangladesh east to the Philippines, and north to southern China. No common name is widely used, though they are sometimes called "Chinese Evergreens". They are herbaceous perennial plants growing to 20-150 cm in height. The leaves are alternate on the stems, lanceolate to narrowly ovate, dark to medium green, 10-45 cm long and 4-16 cm broad, depending on the species. The flowers are relatively inconspicuous, white or greenish-white spathes that can give way to red berries. Plant Aglaonema on soft media. Harsh media can lead to impaired root growth and fail to thrive. Flush with fresh water, but do not let water flooded the pot. Fertilize once a month. Clean the leaves of dust and insects. Pesona Daun Mas Asri (0251) 8242888, Bina Usaha Flora (0263) 581624.